This imaginative tale from R.C. Sproul, based on a true story, begins one evening with Mr. McFarland leading family devotions. When his daughter asks him how she should pray, Mr. McFarland shares a 500-year-old story about a barber and his famous customer. Master Peter is a barber well-known to all in his village. One day, when Martin Luther the Reformer walks into his shop, the barber musters up the courage to ask the outlawed monk how to pray. Luther responds by writing a letter to the barber. The barber’s life and many others’ are changed as they encounter a model for prayer by using the Lord’s Prayer, the Ten Commandments, and the Apostles’ Creed. 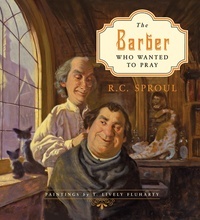 Sproul’s beautifully illustrated story will delight children and help them learn to pray according to the Bible. The full text of the Lord’s Prayer, the Ten Commandments, and the Apostles’ Creed will make this a treasured book to be returned to time after time.